The steep hillsides, rocky bluffs and flat ridges of the Driftless Area were originally covered in prairie and oak savannas, and still harbor more pockets of ancient ecosystems than anywhere else in the Midwest. “One of my strongest drives is to nurture rare and endangered species, and counter some of the damage that’s been done. About one species goes extinct on earth every minute,” said Gary Eldred, one of the founders of The Prairie Enthusiasts. The Driftless Area — 24,000 square miles straddling the Mississippi in Wisconsin, Minnesota, Illinois and Iowa — is more than a place of scenic beauty. The steep hillsides, rocky bluffs and flat ridges were originally covered in prairie and oak savannas, and still harbor more pockets of ancient ecosystems than anywhere else in the Midwest. The area is critical for the survival of hundreds of species of plants and animals that are endangered and threatened elsewhere. For them, the Driftless Area is the last hideout. They include: Henslow’s sparrows, Bell’s vireos, bobolinks, dickcissels, timber rattlesnakes, six-lined racerunners, pickerel frogs, regal fritillaries, Otoe skippers and Gorgone checkerspot butterflies, wild indigo duskywing and ­hickory hairstreak moths, prairie bush clover, brittle prickly pear, Hill’s thistle, dragon wormwood, white camas, small scullcap and dotted blazing star. Fascination with this diversity and an urge to protect it inspires some people to take on the hard work of prairie restoration. The Prairie Enthusiasts (TPE) is a nonprofit environmental organization dedicated to preserving and restoring the prairies and savannas of the Midwest. It was started in the 1970s “by a small bunch of guys who loved prairies and liked to burn them, then drink beer and talk about preserving remnants,” according to the TPE website. 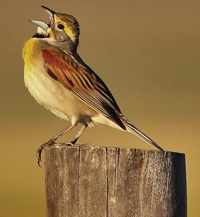 Today it has 1,500 members, most of whom are working to restore prairies on their own land. TPE owns more than two dozen prairie sites and maintains a dozen others. 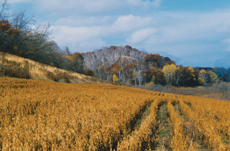 Because of the Driftless Area’s rough terrain, it was not grazed or farmed as intensely as flatter land, so more ancient ecosystems escaped destruction. The prairies here don’t all match the popular image of waving grasses and coneflowers. They are diverse, each adapted to its own combination of soil, slope, sun and weather. Wet prairies occur where water doesn’t drain away; mesic prairies have some water and good drainage; dry prairies inhabit steep bluffs and sandy areas. Then there are oak savannas, places where the prairies of the Western U.S. overlap with hardwood forests of the East. Each has specific mixes of plants, microorganisms and pollinators. Prairies that have never been disturbed, called remnants, are rare. They provide a blueprint for restoration efforts. Most remnant prairies are on private land, so it’s up to private landowners to do the hard work. They are increasingly supported by public agencies, including the Natural Resources Conservation Service; Wisconsin, Minnesota, Illinois and Iowa departments of natural resources (DNRs); U.S. Fish and Wildlife Service; county conservation offices; and many more. 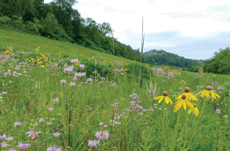 Land trusts and an array of environmental groups are also working to restore Driftless prairies. Kind coordinates the Wisconsin DNR’s Landowner Incentive Program (LIP), which works with landowners on cost-sharing conservation projects, such as opening up old patches of oak forest and clearing cedars from bluff prairies. LIP has tackled 15 projects per year since 2005. The projects are one-time efforts. “But restoration is a 100- to 150-year effort,” she said. Marcie O’Connor and her husband, Mike, bought a 420-acre farm in Buffalo County, Wis., in 2000. Marcie, who has a background in botany and plant ecology, decided to restore it to the way it was before it was farmed. She was curious and thought it would be fun. She did not know what she was getting into. “The first thing we did was try to turn a 150-acre planted crop field into prairie, 20 acres at a time. We didn’t know what we were doing, so we just started,” O’Connor said. First, she didn’t know how much seed to plant. Because prairie seed is expensive, O’Connor gathered her own, watching out the windows of her car as she drove to St. Paul and back, noting where the prairie flowers were, then returning a few weeks later to gather the seed. She gathered half of what she needed and bought the rest. She planted about 30 seeds per square foot. Now she plants 100 seeds per square foot. Another lesson was to plant lots of forbs (flowers), which tend to get muscled out by prairie grasses. In 17 years O’Connor has worked to transform 15 aces of overgrown hillside agricultural fields that were fallow for a long time and six large bluffside prairies, also called goat prairies, that had become overgrown. She is also restoring oak savanna on the south and west slopes of the hills, and wet prairies along a creek on 20 acres that were once drained by tiles. Long-used farm fields are often planted with prairie seed to start. Other areas may only need to be cleared of trees and brush for the seed bank in the soil to rise up again. Prairies will need to be burned off every few years. Still, it takes years to attract helpful pollinators and to accumulate the original microorganisms. Like many prairie restorers, O’Connor has a keen interest in identifying the plants and wildlife at Prairie Haven Farm. She keeps an inventory of animals, birds, butterflies, other insects, plants, fungi, lichens and 800 species of moths on her blog. “It’s astounding, how many critters there are,” she said. 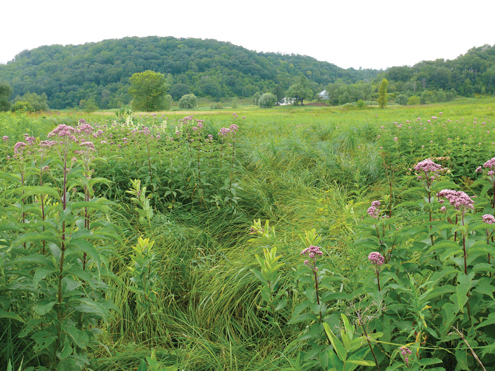 Surprisingly little is known about many of the plants, insects and microorganisms in Driftless Area prairies. Marci and Jim Hess are restoring the oak savanna and prairie on their 46-acre farm south of Mount Horeb, Wis. They think of themselves as citizen scientists. “I’m curious and I want to know more, and I want to keep learning as long as I live,” Marci said. 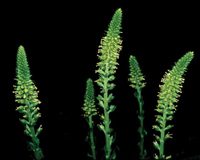 She recently got a grant from the Prairie Biotics company to study a tiny plant called kitten tails (Wolfenia bullii), which is rare in the Driftless Area and threatened globally. “No one knows anything about the pollinators and other insects in relation to this plant,” Marci said. She intends to observe a patch of kitten tails she located on unmanaged land, for several years. Darcy Kind’s counterpart, Minnesota DNR biologist Jaime Edwards, works to restore south-facing bluff prairies (also known as goat prairies because they are so steep only goats could graze them). 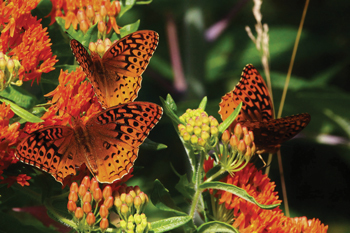 These prairies are home to hundreds of species of plants and animals. Pollinators — regal fritillaries, bumble bees, tiny wasps — are of great interest and concern now, she said, but a lot of her work focuses on timber rattlesnakes (Crotalus horridus), which are categorized as threatened in Minnesota. Rattlesnake hunters collected bounties for rattlers in Minnesota until 1989. Their numbers declined dramatically because of the bounty and because their habitat — bluff prairies — has been disrupted. Farming didn’t disrupt this kind of native prairie, but a native tree — the red cedar — did. The wildfires that once swept across Driftless Area bluff tops and ridges kept bluff prairies open and free of cedar trees. So did grazing goats in many places. But in the last decades, cedar trees have been creeping in, shading the rocks that many generations of rattlers used for sunning. This causes rattlesnakes to move downhill in search of new denning and sunning spots. When they do, they sometimes end up in people’s back yards. Edwards is restoring bluff prairies and reducing encounters between humans and snakes. Clearing undergrowth from old oak savannas and cedar trees from bluffs is rugged work. When I reached Erik Thomsen, co-owner with Beth Schaldach of Ku-Le Region Forestry, he was standing on the side of a hill in Yaeger Valley in Buffalo County. They were clearing a wooded slope with chainsaws. Ku-Le is one of a handful of small businesses that help agencies and landowners with tough restoration projects. Eight or nine decades are nothing compared to the span of time that created Driftless Area prairies. The diversity found here is a treasure long in the making. “We haven’t begun to discover the links between species and the biological characteristics that may be very useful in the future,” Eldred predicted.